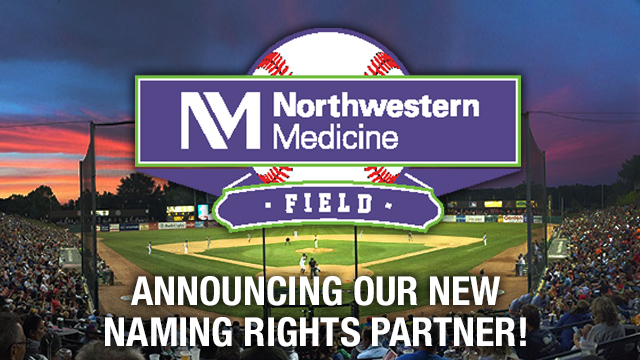 GENEVA, Ill. - The Kane County Cougars, along with Northwestern Medicine, have announced a five-year partnership agreement that will rename the Cougars home stadium which will now officially be known as Northwestern Medicine Field. "We are thrilled to announce this multi-year partnership with Northwestern Medicine," said Curtis Haug, Vice President and General Manager of the Cougars. "Both Northwestern Medicine and the Kane County Cougars organization are committed to providing affordable family-friendly entertainment and improving our community. We look forward to working together on multiple community initiatives in the years to come." The partnership will provide Northwestern Medicine and the Kane County Cougars additional opportunities to connect with families in the community through brand awareness, promotional nights and giveaways at Cougars games, as well as health and wellness events. "This is an exciting opportunity to partner with an organization that has a storied history of success on the field and in the community," said Dean M. Harrison, President and Chief Executive Officer, Northwestern Memorial HealthCare. "We believe this partnership will allow fans to gain a better understanding of Northwestern Medicine and our desire to increase patient access to world-class care in the western suburbs and beyond." Opening Day is set for Thursday, April 6 and a complete schedule for the 2017 season can be viewed online at kccougars.com. For more information regarding tickets and promotions for the 2017 season, follow the Cougars on Facebook, Twitter and Instagram. The Cougars, Class-A Minor League affiliate of the Arizona Diamondbacks, are preparing for their 27th season of baseball having been at the forefront of family-friendly entertainment since 1991. As the only Major League-affiliated minor league baseball team in the suburban area, the Cougars organization has surpassed 400,000 fans for 22 straight seasons. In 2015, the franchise became the first Class-A Minor League Baseball team in history to welcome 11 million fans through the gates. A total of 151 former Cougars have reached the Major Leagues including Miguel Cabrera, Nelson Cruz, Josh Beckett, Adrian Gonzalez and Kyle Schwarber. To learn more about Northwestern Medicine, visit https://www.nm.org/about-us.